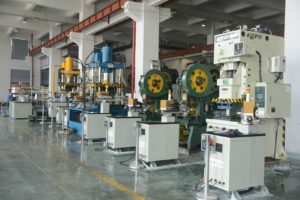 The Hydraulic Press Production Line is primarily used for pressing deep drawn metal parts. There are currently 7 hydraulic press machines in place within this production section, with the pressing capacity of 100T and 400T. Running around the clock, this is where our Iris Dampers (up to dia.800mm) and Access Doors (up to 600x450mm, dia.1250mm) are being manufactured. Next section is the Progressive Die Pressing Production Line, currently holding 10 progressive die pressing machines with a total capacity from 110T to 160T. This technology enables us to produce much higher quality products with far greater efficiency, which is why majority of our products have been upgraded from a single-transfer die to a progressive die. Some of the products being made here are corners, access doors, holders, G-clamps, DSC regulators. What follows next is the Robot Arm Transfer Production Line. 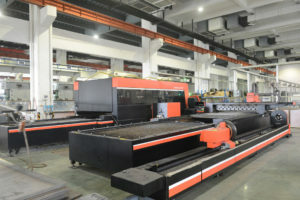 With this asset, we have significantly improved our productivity and efficiency while at the same time also reduced the labor costs, thus making our products even more affordable. There are currently two fully automatized robot arm transfer production lines, enabling us to keep producing big volume products such as iris dampers and metal air valves. For the future, we plan to install new robot arm transfer production lines for other products, thus further increasing the production efficiency and volume. Another vital section in our HVAC accessories & custom metal stamping parts production facilities is the Laser Cutting Production Line. Vital for cutting through up to 20mm of ordinary steel, we currently operate with 3 laser cutting machines with the total capacity from 1KW to 3KW. These machines are enabling us to produce custom metal parts much easier and flexible, while at the same time eliminating the tooling cost investment and minimum order quantity request. In our line of work, welding is another vital operation we cannot do without. And the best way to do it is with fully automatized Robot Welders. 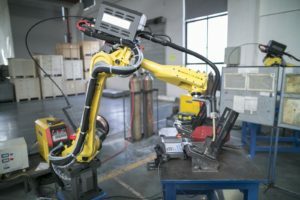 Striving to improve the welding quality and at the same time reduce the labor workload, we have implemented 3 high quality Robot Welders into our production facilities. They are being primarily used for welding custom parts. For the final touch on our products, we own a Fully Automatic Powder Coating Line. This modern fully automatic painting line has been implemented to improve our production efficiency as well as the painting quality. Most common products that go through our coating line are metal air valves, swirl diffusers, iris dampers and also some custom stamping parts. In our line of work, we also need to be capable of designing, engineering and producing different types of tooling (transferred and progressive) for our customers’ needs. An In-house Tooling Workshop is perfect for the job and represents one of our greatest strengths in contrast to our competitors who need to outsource the tools to sub-suppliers. This solution allows us to decrease the development costs, which consequently makes our products much more competitive in the market. Last but not least, there are our Assembling Lines and a Warehouse. We currently have 10 assembling lines for our HVAC accessories in place. These have improved our packaging efficiency by at least 20%. Concerning our warehouse capacity, its size of over 3000 sqm can house about 500 pallets (will increase to 5000 sqm with over 800 pallets capacity in 2019). The warehouse is managed under very strict regulations. The temperature is always at an optimal level and the premises are at all times clean in order to keep the packages in a very good condition, ready for transport. For more information about our production facilities, please visit our Factory Tour.